Klarich was the first to perform the hydrofoil back flip after watching his uncle Mike Murphy land several “gainers” that were not quite end over end (Mike’s were a hybrid between a back roll and gainer). 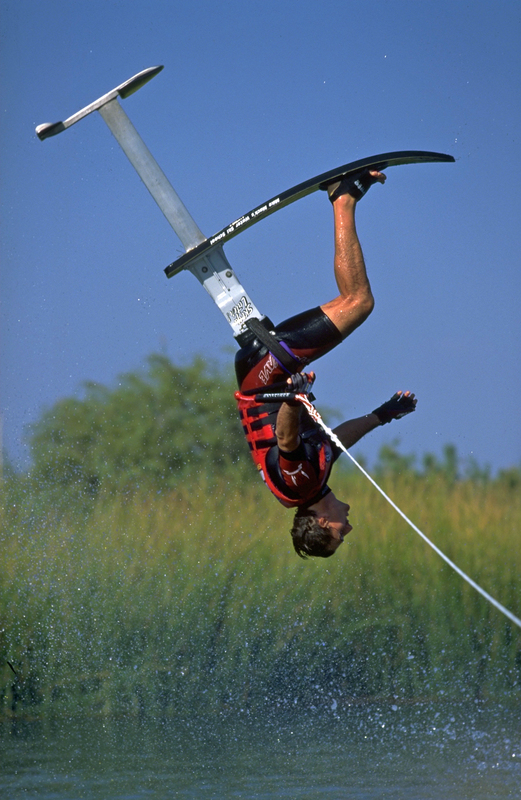 The first ever hydrofoil Fly-In (the brainchild of Murphy) was slated for Mike Mack’s place on Parker Strip of the Colorado River, and Klarich wanted to be ready with a new move. He started with a gainer dismount in the flats, then progressed to gainer dismounts while hanging onto the rope. The slack line allowed for perfect end over end rotation, and next he was riding away with the Mack chopping the throttle for the gainer, and then powering the boat up after the landing. In a few more rides Klarich figured out how to control the line tension at speed and still get end over end rotation, just in time to debut the air gainer at the “All Air Chair Show” during the first Fly-In in 1994.